You know you&apos;re addicted to Pokémon GO when you stop caring about what people think and just randomly twirl in circles on the corner of a street looking for a Bulbasaur to catch. There&apos;s also that delightful feeling when you lock eyes with another person who&apos;s also swiping on their phone—you both give each other a knowing smile, as if you&apos;re in a secret club. We feel the same way and we&apos;re here to help you find the best Pokémon GO goldmines—areas chock full of adorable (yet fierce) creatures to catch and Pokéstops to stock up on Poké balls. You might even land at a Pokémon gym or two for some epic battles. Are you Team Mystic, Valor or Instinct? While there are some hotspots like downtown L.A. and a miles-long stretch of Hollywood Boulevard (even our beloved Jumbo&apos;s Clown Room made the cut as a Pokéstop), we know it&apos;s easy to lose yourself in the game and forget about the traffic-heavy surroundings. Our list of must-go locations is a special one. They&apos;re areas that aren&apos;t inundated with cars—like parks and beaches—and most importantly, they&apos;re beautiful and fun parts of L.A. (for when you actually look up from the screen). We&apos;ve even included some spots to grab a bite just in case you need to revive yourself. Think of these outposts as your Pokémon playgrounds. Happy hunting. LACMA isn&apos;t just for art anymore. You&apos;ll see the works in a new way, like a Urban Light with a Pikachu chilling in front of it, or the the muscle-y Machop getting ready to fight you in front of Jesús Rafael Soto&apos;s "Penetrable" (those dangling yellow hoses). Not only does LACMA have a Pokémon gym so you can get your battles on, but you can also make your way over to the neighboring La Brea Tar Pits, to catch some more creatures. A fiery-maned Ponyta may be in your future. If you get hungry from trying to catch &apos;em all, recharge with a delicious meal at LACMA&apos;s Ray&apos;s & Stark Bar, where you can also grab a craft cocktail...or two. Just like how you can find rare, nocturnal Pokémon at night, water Pokémon are found near bodies of water. Take, for instance, Santa Monica Beach. On and underneath the pier as well as on the sandy beach is a mecca for all-things Pokémon, where you&apos;ll find creatures like Psyduck, Magikarp (who literally looks like a fish out of water here) and Seel to add to your Pokédex. The best part is that you can make a whole beach day out of it and ride the Metro Expo directly there now. If you need to revive yourself after all that Poké-hunting, make a stop on the pier at JAPADOG, where you can nosh on gourmet hot dogs with Japanese toppings. Finally, I found a drantini. 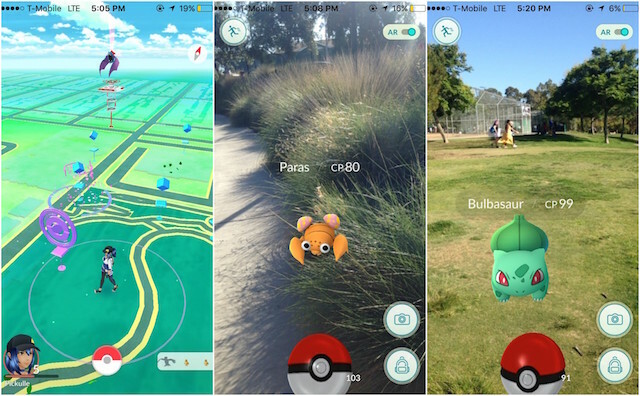 Barnsdall Art Park is not only home to Frank Lloyd Wright&apos;s Hollyhock House, but now also to Pokémon GO fans. Here, you can find a Pokémon gym where you can battle other trainers—possibly even make a few friends IRL—and find a bunch of Pokéstops (psst...the aforementioned architectural landmark is one of them) and a cute Charmander or buff Geodude. This spot has one of the best panoramic views of the city, so you might even want to pack a picnic basket and enjoy your leisurely time there. If you&apos;re not a picnicker and get a hungry, head down the hill to Vermont Avenue, where you can get some Italian food at Il Capriccio or dine on a sidewalk just like in France at Figaro Bistrot. Walking through Exposition Park Rose Garden makes you feel like you stepped right into some romantic Victorian novel. You&apos;re surrounded by never-ending rows of colorful rose bushes, a huge water fountain (that unfortunately has murky brown water), and...oh is that a Krabby I see?! From some of the Pokéstops here, you&apos;ll learn a little bit about the garden, which has been operated by the city since 1928. The best part is this park is open to the public daily, and you&apos;ll even get a chance to fight your little guys at a gym. While you&apos;re there, you might as well hit up Chichen Itza, a Yucatecan restaurant that is just a short walk from the park, where you can get the most delicious tamales and cochinita pibil. Pro-tip: If you take the Metro Expo Line to the garden, the train is mostly above ground, so you can quickly hit up some Pokéstops along the way if you can spin the circular icons quick enough. While you&apos;re waiting for your Metro transfer, what better place to search for some Pokémon than at Union Station? There are plenty of landmark stops to replenish on some Poké balls, and you&apos;ll learn a thing or two about this breathtaking train station that&apos;s nearly 80 years old. If you&apos;re in need of a refresher, the beautiful Traxx restaurant inside of the station has a full cocktail bar. If you want be among your fellow Pokémon trainers, The Grove and neighboring Pan Pacific Park are full of them. You can hit up both spots in the same day since they&apos;re just a short walk away from each other. When we were at the park, we noticed dozens of people playing the game, and found that folks installed lure modules at a couple of the Pokéstops in the area, and we got the good fortune of catching a Pikachu and Paras in the process. And just take our word for it, if you haven&apos;t been to Moruno yet, you should definitely make a stop at the Original Farmers Market so you can try some out-of-this-world Mediterranean food and also charge yourself up for some more Pokémon-hunting. Something we love about Pokémon GO is that it&apos;s forcing us to actually go outside and enjoy the outdoors. Echo Park Lake is packed with trainers and Pokémon creatures, so you might as well hit up the park and maybe even ride a paddle boat while you&apos;re at it. If you need to revive yourself, head over to Square One at the Boathouse to grab a pastry and coffee to keep you going for the rest of the day. Sure, Disneyland isn&apos;t in L.A., but we just couldn&apos;t leave this one off the list. It is a haven for playing Pokémon GO right now (see the glittering map above). You&apos;ll find a ton of trainers staring down at their phones at the amusement park and some even dressed for the hunt. Just imagine all the active lure modules there. If you get thirsty and hungry, make sure to check out our guide on the best places to drink around the Disneyland resort. Jean Trinh is a freelance food and entertainment writer, whose work has appeared in VICE, LA Weekly, LA Magazine and The Daily Beast. Follow her on Instagram, Twitter and on her website.